My partner and I have been house shopping lately, which has proven to be a very interesting endeavor. Of course, like all home buyers (particularly property virgins), we have a vision and don’t want to sacrifice what we want. That being said, we don’t have an unlimited budget. So, (surprise, surprise), we have to sacrifice some of our “wants”. We have been looking at “fixer uppers” lately, which I think would be perfect for our personalities. My partner is a carpenter and I am pretty handy (and also have an eye for design), so we would make a good team. Plus, it might be nice to have our house be a reflection of us, and not the people that were last in it. One of the biggest questions in our minds when we are considering a house that needs renovations is “how much?”, so I’ve taken it upon myself to cost out the renovations for a new kitchen, new flooring, bathroom upgrades and painting. I’ve done a few “best case” and “worst case” scenarios in my research, and I have been able to cost it out pretty accurately. I don’t know if you’ve checked recently, but renovations are EXPENSIVE! There are frequently sales on cabinetry, flooring, and other material needed for a renovation if you know where to look. I’d recommend staying away from places like Lowes and Home Depot for things like cabinetry and flooring because they are quite expensive. Smaller companies might have moving sales or specials on some shades or styles of material. Try looking on the “off season” for renovations, such as around Christmas time. You can usually get a decent deal on the material around this time because the demand is low. This might sound like a no-brainer for all of you budget conscious people, but it’s incredibly important to comparison shop. You may see a style that you really like and want to get it right away, but renovation materials come in many basic styles that most places do carry, so chances are you will be able to get a better price if you comparison shop on very similar products. Don’t get hung up on what the product looks like in the store; the marketing of some larger (and more expensive) stores are more sophisticated, so they can make an actual kitchen. Usually they sell the same products as other stores but at a huge markup. Craigslist has a bad rap. It’s true that there are many scams out there on Craigslist, and other local classifieds sites, but there are also some great deals. There are many people that have leftovers from renovations. Some people buy things that end up not fitting in their homes, or materials that clash that they cannot return. As an example, on the local Craigslist, there was a Maax Keystone White Soaker tub for $200 OBO, brand new. This retails for $300+ tax at the Home Depot for the exact same model. There was also a kitchen sink, never used (still in original box) listed for $260 OBO, and the exact same sink (same brand, same model, etc) in the stores cost $437.73 + tax. The savings are obviously far superior. 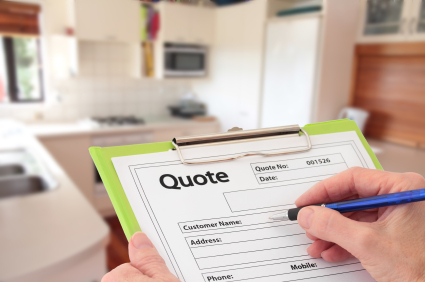 While I wouldn’t recommend doing things that obviously need a professional, such as plumbing and electrical work, there are many things that you can do to save money on your renovations. If you plan to renovate your kitchen, doing the demo of the old one yourself and removing the old fixtures and cabinets can save money, because the contractor won’t have to do it for you. Painting can also be done yourself. If you don’t know how to paint yourself, you can find some great Youtube videos and blog posts that will give you an overview of how the professionals do it, so that you do not end up with a bad paint job. Even installation of some hardware and other fixtures can be a DIY project. Doing what you can yourself can save a ton of money. There are many ways to save money during renovations. How have you saved money on your home in the past? This is a very timely post as we’re getting ready to re-do our bathroom. We want to be able to do as much of it ourselves so we can cut down on the cost. It’ll probably mean we paint what we want painted and maybe ripping some of the old stuff out ourselves. Craigslist for the win! Renos get SO EXPENSIVE so quickly, especially here in Canada. Sometimes I laugh at the prices they quote on US shows, especially for things like drywall. I would DIY almost anything once. I learned how to do plumbing and electrical just by doing. I love some DIY! I would swap the professonals around. Plumbing and wiring are pretty simple – you just have to follow the rules. IMHO to make money out of property you either need to be able to do most things yourself or have a really good builder. I do most of the work myself BUT what I don’t know I will contract out as the worst thing someone can do is pretend they know what they are doing. I’ve seen so many renos gone bad because of this. There’s nothing wrong with admitting you can’t do it because you don’t have the skills. No one expects that every man and woman can become a carpenter or skilled tradesman without the experience and education. Sometimes thinking one can do it on there own costs them big time down the road. Do it right, the first time and that’s the best advice. I’ve gotten wagjag coupons for building materials in the past for 50% off which was awesome as well. Very great post. Renovations need not to be expensive. If you can do it yourself, then you will save a lot of money from paying someone for the labor. There will also be a sense of personal touch to your home.